A tunnel is formed in the hand by the carpal bones and a ligament, which serves as the ‘ceiling’ (transverse carpal ligament). 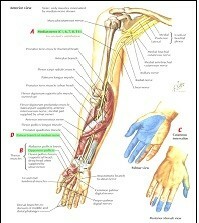 It contains all the flexor tendons of the fingers and the median nerve. The latter is the nerve responsible for complaints related to CTS. This space may narrow as a result of several factors (age, manual labour, pregnancy, trauma, etc. ), which causes the associated complaints. CTS is more common among the elderly but can also occur among young people! What are the complaints associated with carpal tunnel syndrome? Complaints mainly consist of unpleasant tingling and numbness in the fingers on the side of the thumb (thumb/index finger/middle finger/half of the ring finger). This mainly occurs at night, but may persist throughout the day. Certain positions such as reading a book, cycling, telephoning or driving a car may bring on the complaints. The complaints are not always as prominent and in some cases manifest more as cramp, loss of strength, a ‘heavy’ feeling or the loss of fine motor skills (sewing, doing up shirt buttons). A needle electrode test (electromyogram = EMG) is always performed to confirm the diagnosis and localisation of the pressure on the nerve. This also determines the severity and degree of nerve entrapment and whether or not a radiating pain originating in the neck (cervical vertebrae) can be ruled out. Before performing a procedure, in some cases it is decided that the patient will wear a night splint, have physiotherapy and/or receive an infiltration (injection) in the carpal tunnel. These treatments usually provide a temporary improvement. The decision depends on the severity of the entrapment. 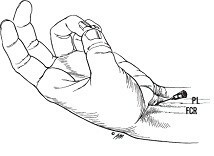 If the specialist decides to operate, the carpal tunnel can be opened in two ways: open technique versus endoscopic technique. 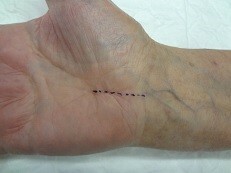 The open technique (OCTS) involves an incision being made in the palm of the hand under local anaesthetic and the ligament being split down its entire length. With the endoscopic (ECTS) or keyhole surgery technique an incision is made in the wrist and the tunnel is opened from the inside. This procedure is performed under loco-regional plexus anaesthetic. 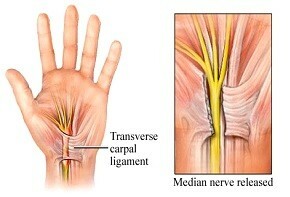 Advantages include less pain in the palm of the hand due to the smaller incision and quicker recovery. Both techniques are standardised techniques and performed very frequently. They are rewarding procedures with a high success rate. After the operation a compression bandage lined with wadding is applied and worn for one day. The next day you are expected to visit your GP so he or she can inspect the wound and plan the care pathway for the wound, and to remove the stitches around ten days later. It is firmly recommended that you start moving the fingers and the wrist right away. You should expect a temporary loss of strength and localised discomfort from the scar during the first few weeks following the procedure. This should subsequently heal completely.